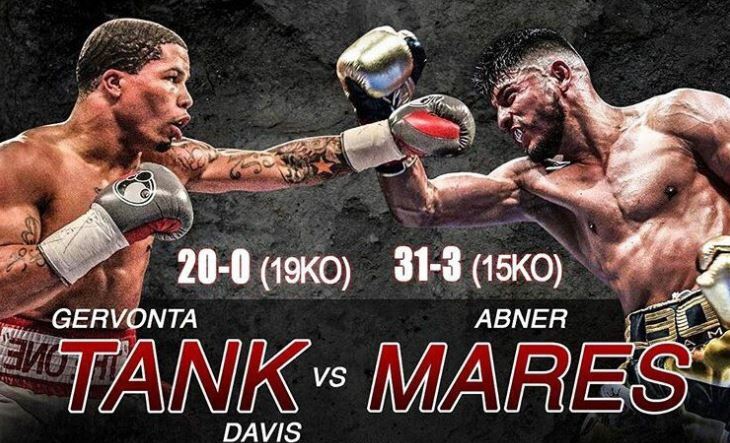 Gervonta Davis and Abner Mares are getting closer to throwing it down in the ring. Sources told FightNights.com that the unbeaten Davis will defend his WBA "Super" junior lightweight title against Mares in early 2019 -- likely February 9 in Los Angeles. The Premier Boxing Champions bout is expected to be telecast on Showtime. Mares (31-3, 15 KO's), 32, a Mexico native training out of Montebello, California, who has won world titles in three different weight classes, will move up to 130-pounds for the second time in his professional career, but this time it will be for another shot at world title glory. His last fight at the weight class was in December 2014, when he scored a fifth-round TKO over Jose Ramirez. Mares last appeared in the ring in June for a 126-pound title rematch against Leo Santa Cruz, who won by unanimous decision. Santa Cruz won their first bout by majority decision, though most ringside observers had him winning nine of the 12 rounds. Davis (20-0, 19 KO's), 24, of Baltimore, one of the sport's most devastating punchers, has been inactive since his third-round stoppage of Jesus Cuellar in April due to a plethora of personal issues. Davis announced on Snapchat in September that he needed to lose weight, but that same night, he ended up behind bars after getting into a fistfight with another man outside of a Washington D.C. nightclub. Since then, Davis has appeared well over 130-pounds. However, he is back in training, and has at least three months to get back into top form.